Finally businessman and Mr. Gay World - Philippines 2009, Wilbert Tolentino launched the newest and revolutionary kind of entertainment which highlighted 24 one of a kind production numbers he conceptualized, perfect for the millennials! These fabulous and exciting performances are definitely world-class and are featured in the The ONE 690 located at 39 Roces Avenue in Quezon City, in front of the Amoranto Sports Complex. Since 1972, Club 690's entertainment definitely showcases quality diversion and recreation. Already in business since the Martial Law and when curfew hours were strictly impose, when women were not yet allowed to enter the club. Founded by Boy Fernandez and managed by Raoul Barbosa, the entertainment club closed temporarily until Wilbert opened it again with co-owner / manager Genesis Gallios. The partners also are the brains behind the concept of the evolution of their shoes. According to Wilbert "since 2004 binigyan ako ng basbas na ipagpatuloy ang 690 ni Boy Fernandez dahil nakita niya passion ko sa entertainment industry... and the rest is history!" As time passed by, women started to patronize the entertainment bar and the other clubs with similar theme. At present, the club is definitely no longer "for gays only"; people all gender, people from all walks of life patronize the bar without hesitation, much to the guests delight. The awesome Las Vegas - type production numbers and amazing costumes are praised and enjoyed by everyone. The club features Las Vegas - type shows and numbers that are comparable to Broadway in New York and Moulin Rouge in Paris. The entertainment bar business has definitely evolved and is in tuned with the modern times," says Wilbert. And the good news, Wilbert is gearing up to put more establishments that will cater to the general public and will surely add glitter to the field of entertainment this 2019. From the underground to mainstream, as new millennium begins, the gay bar industry is indeed becoming more open and welcoming to the public, as more guests come to visit the The ONE 690. "We levelled-up The ONE 690 with our regular Girls' Night Out which is trending among female millennials. We also have many booking of bridal shower parties! "Open-minded na ang society ngayon compared noong 70's, 80's and 90's na henerasyon. Kaya ginamit namin ang tagline na "QUALITY MALE ENTERTAINMENT". Wilbert further added "Old school gay bar no more!" 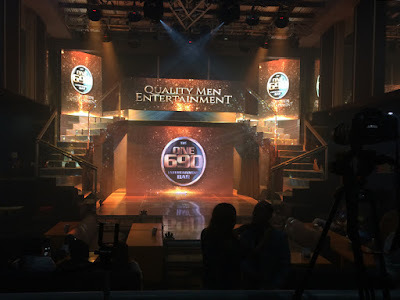 The ONE 690 is dubbed as the 'The club that started it all' of the Philippines and the very first gay entertainment bar to have a billboard in EDSA and highways. This is also one of the reasons why Wilbert and his company nonstop bringing the best quality entertainment. They've invited friends from the media and social media online influencers to witness their 24 production numbers, one of which was inspired from the Broadway show Moulin Rouge, the best of Princess of Pop concert of Britney Spears, the California Girls beach party of Katy Perry and many more. These were performed by the Pink Mannequins and the boys of The ONE 690. 717-B Roxas Boulevard in Baclaran.